Peeled and sliced carrots, cook them until tender. 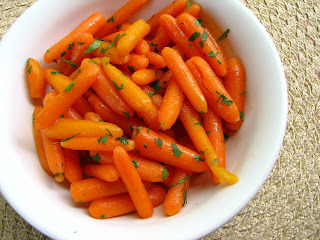 To make this really easy, I love to use baby carrots. They are just the right size and already peeled. Melt butter, mix with a little ginger and honey to taste. The butter should come up 1/4 of the way on the bottom of the dish. Pour over carrots. I like to sprinkle a little chopped parsley - makes it look pretty. Cover with foil and bake. Since the carrots are already tender, you don't have to bake this very long at all.